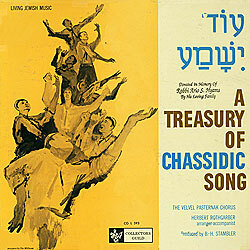 Notes This group of simple spontaneous Chassidic songs has become a part of Jewish life. They are sung and enjoyed at festivities and ceremonial occasions, and are taught in schools and camps year round. Although these melodies are gay, foot-tapping, finger-snapping folk tunes, the words are all drawn from the liturgy. The intrinsic beauty of the music has been enhanced by the tuneful arrangements of Herbert Rothgarber and the outstanding musicianship of Velvel Pasternak and chorus.